This entry was posted in Recovery & Support and tagged Addiction, Friends and Family of Addicts, Support, Treatment on August 30, 2016 by Team Addiction Hope. Recovery programs provide guidelines for addicts, not foolproof solutions. These professional programs rely on help from friends and family to support addicts during their time of need. Recovering from a dependency problem is an incredibly difficult and grueling process. For any real chance at sobriety, the whole family needs to contribute toward a recovering addict’s healing. Rehabilitation programs provide group and family counseling for a reason. An addict’s journey is much more likely to end in success when he or she builds a stronger relationship with family members and others. The recovery process will suffer without help from family members. While individual therapy addresses the thoughts and behaviors of the person seeking treatment, family therapy focuses on a network of people the addiction affected. This helps the addict realize that he or she is not alone, and that addiction affects more than just one person. A family unit shares a strong emotional bond, even during and after one’s addiction. Family therapy gives everyone the opportunity to share their fears, thoughts and feelings. This opens the floor to discussions about addiction triggers, such as marital fights or unemployment. Open communication and transparency go a long way in helping an addict realize there is more to life (and stress relief) than substance abuse. In a neutral group setting, addicts can talk freely about their addiction. Find an addiction therapist near you who offers family counseling and discuss how this choice can help your loved one. Letting your loved one know that addiction is not an isolated problem can encourage him or her to stay strong during recovery – if not for himself or herself, then for the family. One of the steps toward recovery is making amends with the people whom the addiction harmed. This includes family members who were there for the duration of a loved one’s addiction and who likely suffered in some way because of it. An addict cannot move on to the remaining steps of recovery until family members forgive him or her for past errors. During recovery, your loved one needs family support more than ever. Refusing to be there for him or her during these critical early steps can cause a major setback. Your family therapist may ask you to attend group meetings for the family members of addicts, such as Al-Anon. These programs can make family members better understand how to help a loved one as well as provide coping methods. Addiction impacts every family member. The consequences of a process or chemical dependence can trickle down, affecting more people than the addict realizes. Addiction recovery is not an individual process. It includes identifying family members who may be targets of abuse or at risk of developing a dependency. To be beneficial in the long term, it’s necessary to involve and to treat everyone in the recovery process. RiverMend Health Centers, based in Georgia, is a rehabilitation network that emphasizes family therapy in each treatment program it offers to drug and alcohol addicts. To learn more about RiverMend, click on the button directly below. 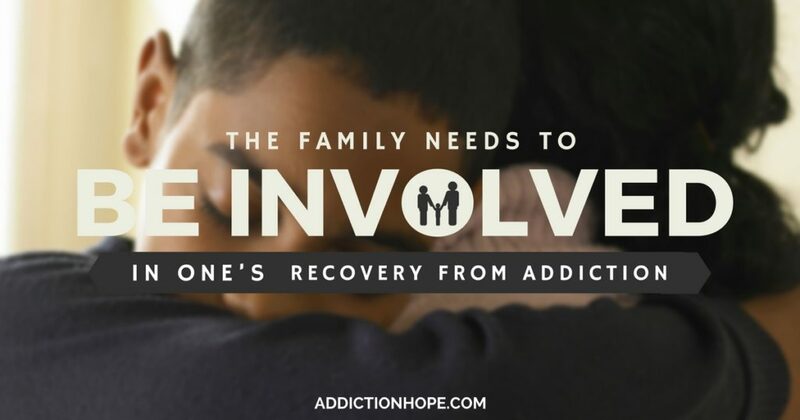 Have you ever seen someone recover from addiction without involvement from his or her family? Please share your observations below. I really appreciate your comments that addiction impacts every family member and how the consequences can trickle down farther than you might realize. I never really thought about how important the inclusion of loved ones could be in this process until now. I imagine that involving family members in a chemical dependence recovery program would also provide additional support and make it easier to get through emotionally.